It is with a heavy, heavy heart that I give you the news of Jan Merrill-Oldham’s passing. 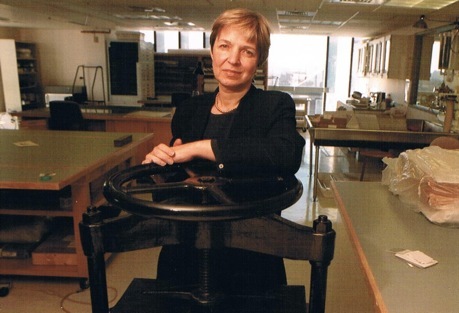 As many of you know, Jan meant the world to me as a young conservator. Her constant support of young professionals is why three of us set up the new ALA-PARS Jan Merrill-Oldham Award that, luckily, Jan knew about prior to her death. I believe Jan knew how beloved she was, and hope that she now rests in peace. Below is the announcement by her husband, Pete, who deeply loved and cherished Jan…and the feeling was completely mutual. RIP Jan, you have truly made a difference in this life. Janny passed away Wednesday night October 5th at 8:35 pm at her home in Cambridge. After always far surpassing the doctors’ estimates of how long she would live, she finally let go last night in the presence of her wonderful hospice aid Vilma Barrios and me. It was a peaceful transition, and as had been the case for at least the last five months, was unaccompanied by any noticeable pain or suffering. For those of you that had the pleasure of visiting her at home these last nine months the accompanying photograph illustrates that ever-present Janny smile that sustained all of us throughout her illness. A memorial service will be held at the Mount Auburn Cemetery in Cambridge in the Storey Chapel at 1 pm on Saturday October 15th, followed by a reception to celebrate Jan’s life at our home in Cambridge. Please feel free to forward this to anyone you feel would like to know of Jan’s passing. Thanks for this. I don’t currently work in preservation, but Jan started me on a career in librarianship by giving me an apprenticeship at the Weissman Center almost 10 years ago. I valued her humor, intelligence, kindness, and generosity. I miss her already. Edited, thanks Sarah and thank you for your remembrance. Thanks for sharing your memory Chela.